Each year, Herman Miller selects a product for its Select Program, which is a limited edition product release that is meant to be a collector’s item. This product could be something that is brought back from the archives, a new interpretation of a classic, or even a new objet d’art. 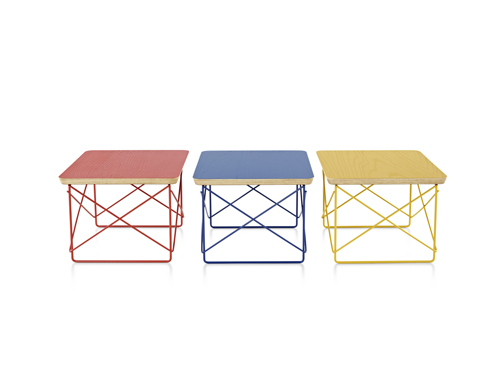 This year, three limited edition colors of the Eames Wire Base Low Table (also known as the Eames LTR Table) will be released in cobalt blue, red-orange, and yellow gold – which were colors used on the Case Study House #8. These products will be available starting in October at all Herman Miller retailers, and will continue until Spring 2013. Suggested retail: US$294. 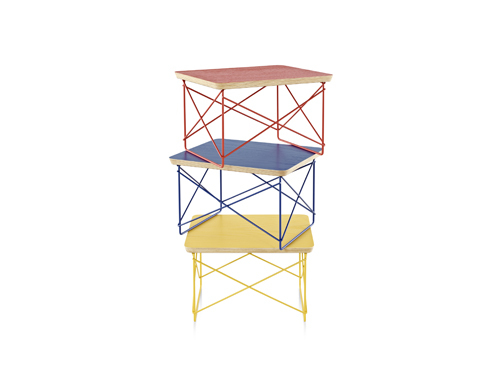 Previous Select Editions have included the George Nelson-designed Tray Table from 1961, with a special sunburst inlaid top inspired by his 1955 clock called “Flock of Butterflies” (2011); a walnut and black version of the Eames Hang-It-All (2010); A series of Tops inspired by Eames’ love of toys and their famous film, ‘Tops,’ (2009) and the first Select Program design, a cowhide-upholstered version of the Eames molded plywood LCW chair (2008).